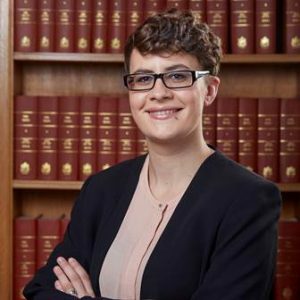 Our congratulations go to Dr Sam Giles for receiving one of the 2016 L’Oréal-UNESCO Women in Science Fellowships in recognition of her position as one of the UK’s most promising female scientists. Sam was a member of St Hugh’s from 2011 to August 2015 when she completed her DPhil; she is now working at Christ Church as a Junior Research Fellow. Sam is a paleobiologist who employs x-ray tomography to study the evolution of the brain and its surrounding bone structure in ray-finned fishes, the largest living group of vertebrates, containing over 30,000 species. By comparing the brains of modern fish with 3D reconstructions of their ancestors, the research will help understand how the evolution of the brain contributed to the success of this group, with significant ramifications for understanding rates of gene mutation and evolutionary change. The Women in Science Fellowships were launched in 2007 and are awarded annually to outstanding female postdoctoral researchers. Each award is worth £15,000 and is used to support a 12-month period of postdoctoral research in any area of the life, physical sciences, mathematics and engineering. The Fellowships have been designed to provide practical help for the winners to undertake research in their chosen fields. St Hugh’s tutorial fellow Professor Dora Biro also won the award in 2010 for her work on knowledge transfer and its integral role in species preservation. For further information please see the website.